The prevalence rates of high blood pressure and cardiovascular risk have increased in youth, given increasing rates of overweight and obesity. Dietary electrolytes influence blood pressure (BP) mechanisms in youth, and previous research indicates that dietary sodium, potassium, and calcium have clinically important effects on BP regulation. Electrolyte balance is essential for health, and the beneficial effects of decreasing sodium intake on BP in youth have been strongly supported. Though interventional studies demonstrate that reduced intake of sodium is beneficial for BP, it is not clear whether children and adolescents can adhere to long-term efforts to reduce sodium intake. There is a growing body of evidence that increased potassium and calcium intake also reduces the risk of high BP in youth, and studies suggest that some youth may be more likely to adhere to diets that emphasize adding foods (e.g., foods containing potassium and calcium) rather than eliminating foods as is the case with a reduced sodium diet. 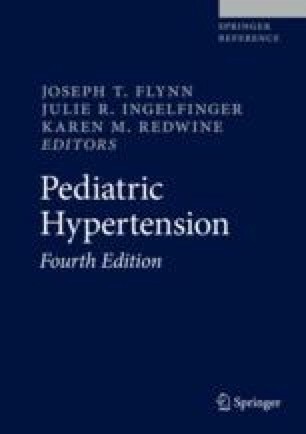 The purpose of this chapter is to summarize the nutritional electrolyte-related determinants of blood pressure in children and adolescents, specifically the roles of dietary sodium and potassium in regulating casual BP, BP reactivity, and circadian BP patterns in youth. This work was supported in part by a grant from the National Institutes of Health (R01 HD072153) to Dawn K. Wilson, Ph.D., in part by a training grant from the General Medical Sciences (T32 GM081740) to Tyler C. McDaniel, M.S., and by a grant to Sandra M. Coulon, M.A. (F31 AG039930).